Energy Supervisor is a real-world system that has been used successfully in buildings across North America. Independent audits revealed that the system realises total energy savings between 25% and 40%. The buildings that make up Maple Ridge’s Municipal Operations Centre and the Pitt Meadows Family Recreation Centre serve a wide variety of uses. The civic buildings at the center of this project include health care offices, buildings dedicated to administrative purposes, daycare and early education centres, RCMP facilities, a cafeteria, gymnasiums, recreational and meeting spaces, and warehouses and garages. In an independently-verified one year trial, the municipal buildings in Maple Ridge and Pitt Meadows realized total energy savings greater than 25%. 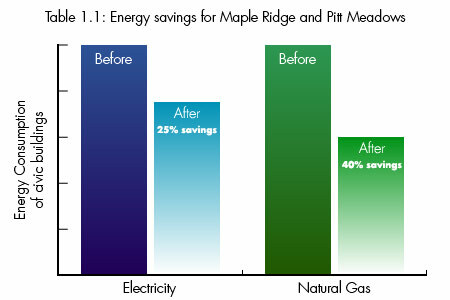 Energy Supervisor helped management reduce electricity consumption by 25% and natural gas use by 40%. In addition to the tangible results associated with our energy saving technology, many of the people who work in the buildings involved in this project experienced increased comfort levels at their workplaces. Since the Energy Supervisor was installed, there has been an obvious improvement in the comfort level within the health clinic. There is a constant consistent temperature whenever we are here. I know others have seen a similar improvement; whatever their requirements are.